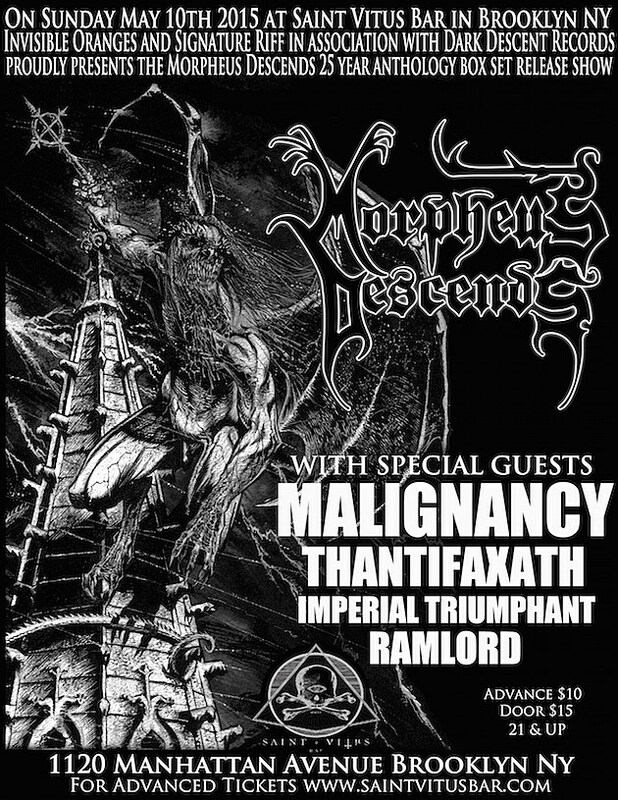 We’re very excited to team up with Signature Riff to present what will be a very special show on Sunday, May 10th at Saint Vitus in Brooklyn with performances from Morpheus Descends, Malignancy, Thantifaxath, Imperial Triumphant and Ramlord. The show will celebrate Morpheus Descends 25th anniversary and the release of a box set containing all of the band’s works (including work by Morpheus, an earlier incarnation), a DVD of live performances, and a recording of two new songs. Morpheus Descends is something of an underground NYC death metal legend, an early runner alongside Immolation, Malignancy, Suffocation and the like that produced just two EPs, a demo and one album before calling it quits in 1998. Though the band reunited on and off, they never recorded again. It’s a shame, as those early releases are gems—pummeling and poised—and they are now rightly highly sought after. 2015 is when the engine gets going again for Morpheus Descends. The band will be playing Maryland Deathfest, the inaugural installment of Obscene Extreme in North America and, now, Saint Vitus. They’re also recording a new full-length. Malignancy kept it going through the 90s, and they top off the bill with Morpheus Descends as NYDM brothers in arms. Canada’s Thantifaxath comes from a different end of the spectrum, and is responsible for one of last year’s best albums, the bleak, wonky and claustrophobic Sacred White Noise. New York’s Imperial Triumphant just released a new album of twisted and cavernous black metal that’s been earning “game-changer” comparisons to Gorguts’ Obscura, and Ramlord just released a new seven of remarkably melodic and unexpectedly lush crust. We hope you make it out on Sunday, May 10th at Saint Vitus. Tickets are available now through this link and are just $10 ahead of time, $15 at the door. Stay tuned to IO’s Facebook and Twitter for additional details, and see you there.